Darko is not the biggest bust of all-time, and other findings. Why did the Boston Celtics select Jaylen Brown as the 3rd overall pick in the 2016 NBA draft? It’s questions like this that fuel the subreddit r/nba during “shitpost” season — the down time between free agency and the start of the next NBA season. Conversations often gravitate toward the debate of a draft pick’s potential versus proven ability. Is he worth the risk? While we can’t predict how this year’s rookie class will stack up, we can look at what the past can teach us as we redraft 20 years of picks using their career stats. How bad was Darko, really? 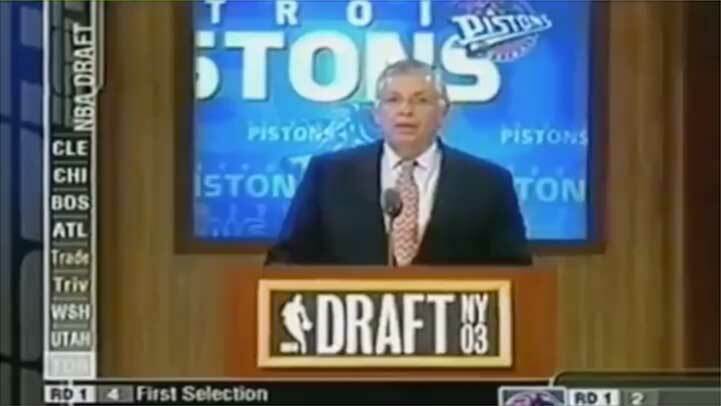 To illustrate how the redraft works, let’s look at the most notorious draft pick in modern basketball, Darko Milicic. If we rank these five based on their career Value over Replacement Player (VORP), a very solid all-in-one stat, Darko would have dropped to the 24th pick. This means there were arguably 22 better choices than Darko, including the likes of Luke Walton. That’s the redraft in a nutshell; applying a player’s career VORP to determine what the draft should have looked like. Though he ultimately spent 10 years in the league, Darko finished with career averages of 6.0 points, 4.2 rebounds, and 0.9 assists per game, resulting in a VORP of just 0.8. To put that number in context, LeBron’s current VORP is 108.6, and he isn't even close to retiring. Now that we understand how the redraft works, let’s dive into the data. Is there order in the draft? A look at 20 years of picks since 1989 — the year the NBA began the two-round system. Successful careers can come from anywhere in the draft. When we use VORP to redraft, there is some significant movement across the board. One thing to keep in mind: VORP is a cumulative stat, so players who are still active will continue to change. For context, compare where Darko started to where he ended up. Note: That big chunk of players in gray played less than 1,000 minutes (or never) in the league. By default, they are redrafted lower than everyone else. One of the more unexpected takeways is that just barely over half the guys drafted end up “making it” in the NBA. Even getting picked in the top 20 does not guarantee minutes, let alone a successful career. If that's the case, is it even worth having two rounds? Let's look more closely at draft expectations. 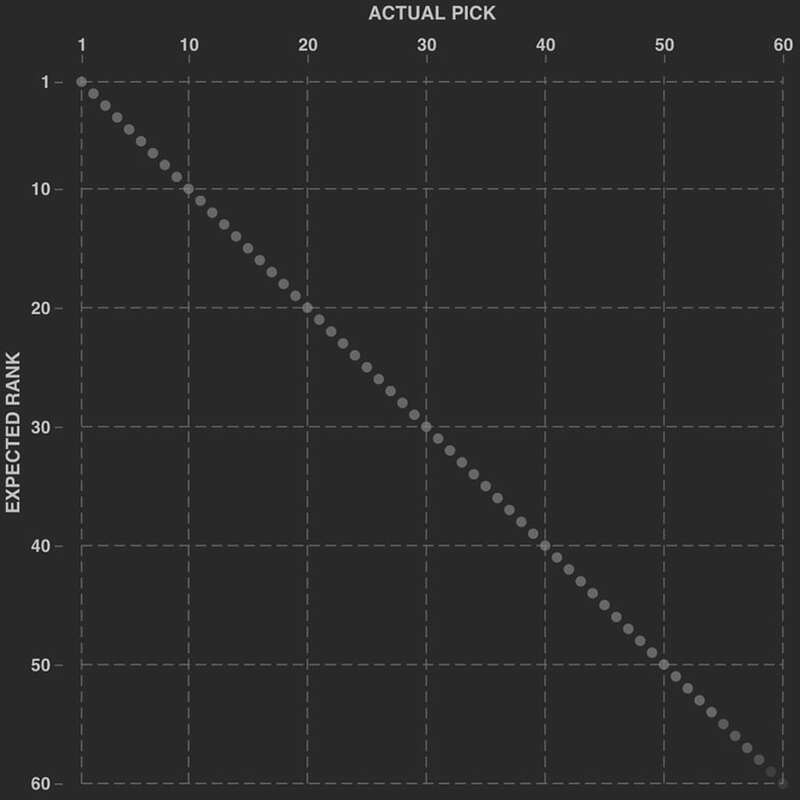 Should we expect higher picks to perform better? Comparing redraft movement across years, pick-by-pick. If the GMs got it right, we would expect the first player to go first, the second to go second, and so on and so forth. 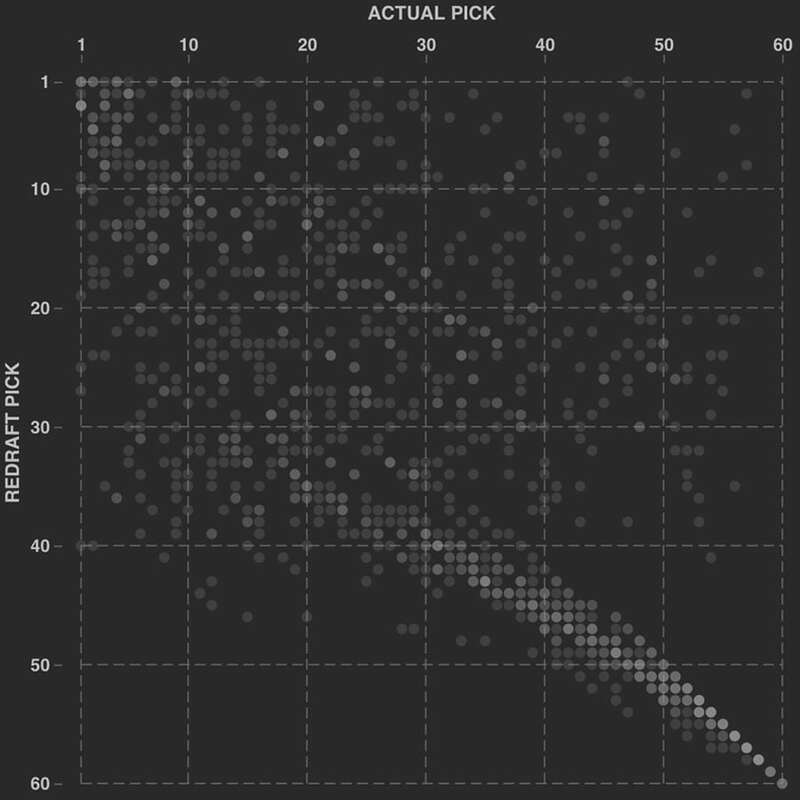 The actual picks compared to redraft picks would match up. What actually happens isn’t that perfect. Guys are under and over-valued across the board. The only obvious consistency is that getting picked later in the second round means the player probably belongs there. 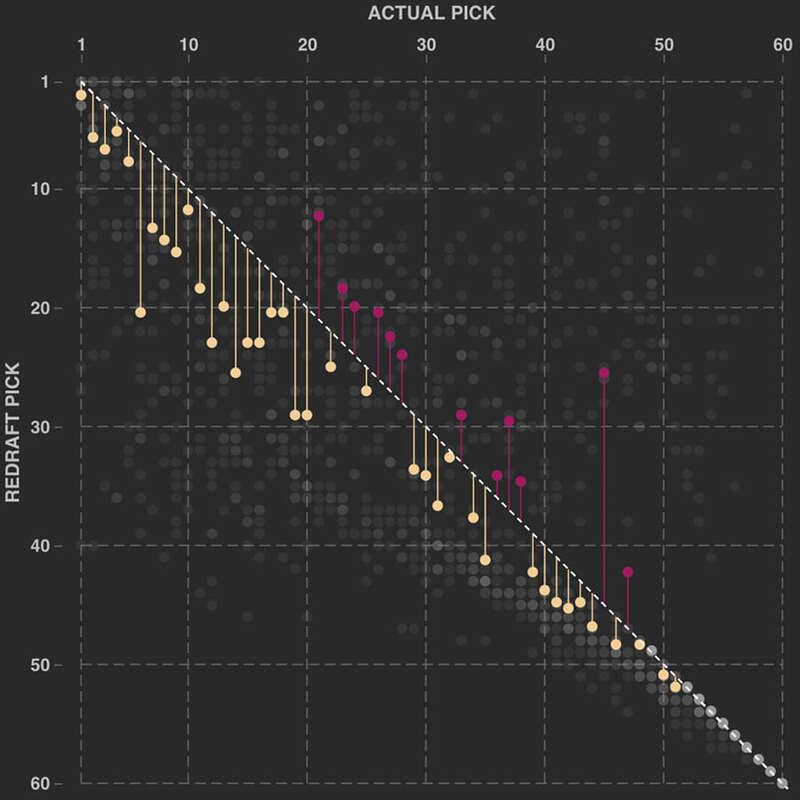 When we compute the average redraft rank for each pick, notice that most picks end up close to their expected rank. Higher picks tend to drop more often, which makes sense because there is less potential for upward mobility. So the GMs do okay for the most part. But how do we explain the disorder? Simply put, the outliers make more waves, and more headlines. When we reframe and highlight the amount of redraft movement, we are left with the interesting ones, a.k.a. the steals and busts. Who are the biggest steals & busts? Putting a value on player movement to decide who are the biggest steals and busts of this era. To determine the biggest steals and busts, we will use a comparison of value rather than spots moved. Spots moved is a decent metric for busts, but doesn’t take into account the quality of the draft. Relying solely on spots moved diminishes a guy like Kobe Bryant, who was drafted 13th and nets a move of +12. Any second rounder who gets minutes can easily move +20 spots, making them appear to be a bigger steal than Kobe. Instead, we will use a value by comparing the VORP of each player with that of the player who should have been available at that pick, according to the redraft. For Kobe, that means he gets a score of +59.1; Kobe’s VORP of 72.1 - 13.0 (Zydrunas Ilgauskas). Kobe exemplifies a huge steal that only moved up 12 spots because the Lakers ended up getting a once-in-a-lifetime player at the 13th pick. Using VORP isn't perfect, but it provides an excellent quantitative starting point for this debate. It just so happens that our biggest steal and bust were from the same draft class. Joe Smith got the double whammy of being an average player (a VORP of 5.9) taken at the number one spot, and being in the same draft as the legendary Kevin Garnett. KG put up huge numbers for 21 seasons, with a VORP of 94.0. His steal status is further elevated because the 1995 draft class wasn’t loaded. What was the best draft class ever? 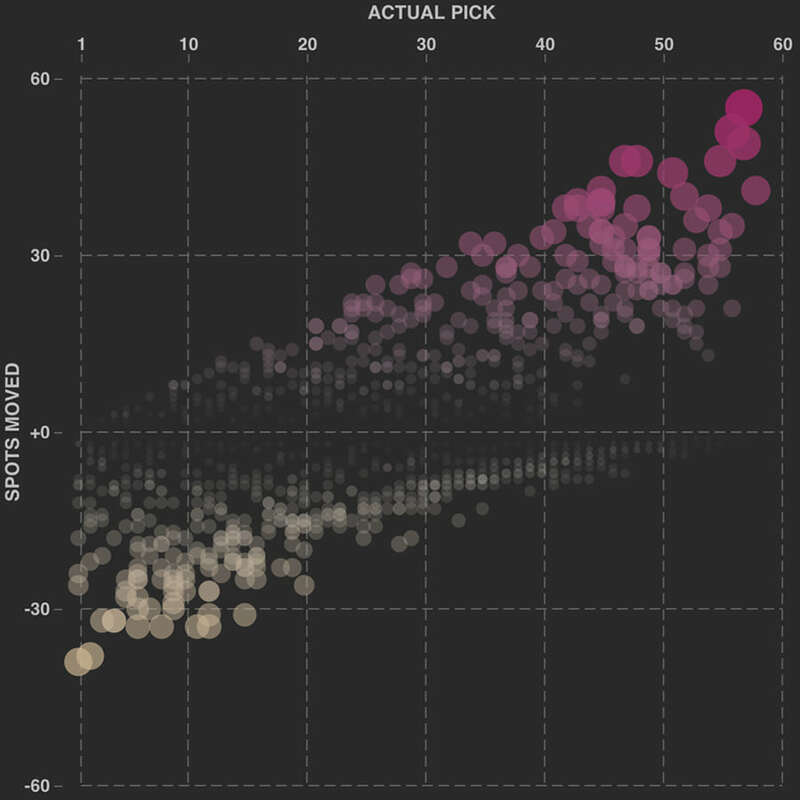 Using average value for each year's draft picks to find the statistically best group. There are two ways to approach calculating the best draft class ever: focus on elite players, since they are what teams are built around, or evaluate the entire class, top to bottom. Take your pick. Methodology: I chose to use VORP over other all-one-stats like PER and Win Shares because it aligned better with the eye test. I also compared the top 50 players of all-time for each stat with a few subjective top 50 lists, and VORP produced the most similar results. VORP also includes minutes played, so it isn't solely a rate stat. That being said, I chose to exclude any player who played less than 1,000 minutes in their career in the calculations, since I feel that means they barely contributed and never "made it" in the NBA. An additional factor for busts is that they had to drop out of the top 10, and steals had to get into the 10. Thanks to Basketball Reference for the data. The video was created from a selection of Youtube videos. Get in touch: russell@polygraph.cool or @codenberg.